"Without the darkness, there can be no light." I do not own the rights to Fire Emblem, nor am I affiliated in any way with Nintendo, Intelligent Systems, or any other company. 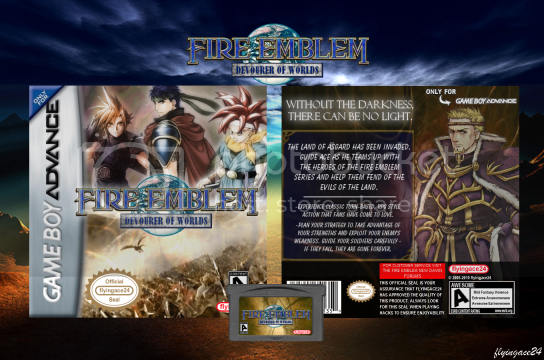 Fire Emblem - Devourer of Worlds is completely a non-profit fan project, powered only by love and appreciation of each game series. Two years pass from the events of Fire Emblem - Devourer of Time. Through the Lifestream, Sephiroth travels to Asgard, the center of the Fire Emblem universe. Through the Asgardian legends, he learns of the calamity from the sky, Lavos. In order to summon Lavos, the six Fire Emblems of Akanea, Valencia, Jugdral, Elibe, Magvel, and Tellius must be gathered, each one represented by a kingdom in Asgard. To prevent the chaos and destruction of the land, the Asgardian rulers summon the Heroes of the Emblem, called the Warriors of Justice. As a counter move, the Evils of the Emblem are also summoned, dubbed the Warriors of Destruction. Thus begins the War of the Emblems. I was searching around my old freewebs account and found this. This was from May 2011, which is pretty much the last time I ever touched a hacking tool. Since I'm most likely never going to work on this again, I decided to just let people try it out. Sorry it isn't much. From what I've seen it's only about the first five chapters. I haven't tried it out, so I don't know really. Let me know how far it goes. Note that I've also included the script and plot outline for a few a little bit more of the game. You can read it if you want. Well than what is this: http://www.freewebs....Preliminary.rar? My noob self might come out and cry because of this. I thought it would never come, but the day is here. Can't wait to give it a run through. stupid me being busy all day today! @Axel: Oh man I totally forgot about that (the fact that I uploaded it, that is). That thing is SUPER old DoW when it was on FE8. I didn't play it yet, but I think that's when it was still a reskin. I'm pretty sure it's the first (of three) versions of DoW that I worked on. @fuzz94: Glad to make you happy. Let me know what you think of it. @Blazer: Yeah you can add it if you want. Let me know if you want me to type up some info. I don't really care if you don't work on it anymore...But could ya come to the forum just a liiiiiittle bit more? Didn't this end up restarting like, 8 times? I would assume this would be the most recent version. If you happen to find older versions of it around somewhere I'd suggest just linking all of them here. Idk bout everyone else, but I would deffinently give older versions a run through. I don't have any of that stuff on my computer anymore, but I may have some stuff that I've uploaded as backups from a long time ago. I'll check the stuff out and see what I can find. Now you just have to agree to frequent the forum, and all will be good. Awesome. From what I read it seems like that ptch will go through Lyn mode, because there are no plots written for chapters after that. Same goes for the script. @arimibn: Sadly, I don't think I can promise that. As a first year teacher, I have to go through a lot of training and stuff. I don't know how busy I'm going to get. I can promise, however, that I will be here for the next few weeks. @fuzz94: I planned pretty much the entire plot in my head at one point. I just failed to write it all down. I jotted down a bit of it in what you see in the download, and I did the entire script for the first 7 chapters and only did the actual hacking for 5. In addition, interestingly enough, Slash from Chrono Trigger was actually named after Slash from Guns 'N Roses. Anyway, this post is to say that I've added the previous versions of Devourer of Worlds. Both of these are for FE8. I was just looking around my old freewebs account and found a whole bunch of betas (and some other goodies unrelated to DoW). These are the latest of each of the respective versions (though both are still from 2009). They're up so people can see the differences of what I was planning. The last two should be fairly similar though. Anyway, enjoy. I see. I'm on chapter 4 right now, I haven't had a whole lot of free time to play it, but I do enjoy it thoroughly. If you don't mind me asking, do you recall how the rest of the plot was going to play out? (I know that everyone battles Zephiel, Magus and Sephiroth and then the Darkness comes out of Ace.) Although I fugred you would have used the Dragon in the end to be Lavos. Also I'm pretty sure Flea, Slash and Ozzie were all play offs of musicians, but I never looked into it. So I finally got around to beating the first five chapters. It was very fun. Celice and Leaf ended up being straight beasts, followed by Marth. Cellica, dispite the low HP and low health, tanked in Mag and the enemies had barely any resistance. So...is this the final version?